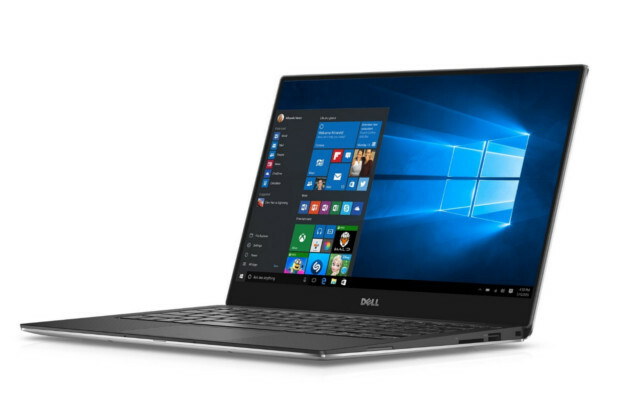 Dell has done a pretty amazing job when it comes to its XPS lineup and in fact, as far as Windows laptops are concerned, these are probably amongst the best Windows has to offer. Often times we'll see a comparison between a top notch XPS vs a high end MacBook Pro and, more often than not, the XPS comes out swinging. Today, we're gonna take a look at relatively affordable Dell XPS 9360-1718SLV. With its latest ultrabook Dell has decided to deliver a QHD display that's almost without a bezel as well as a seventh generation Core i5 processor, 8GB of RAM and very lightweight design that rivals even Apple's infamous 13 inch MacBook Air. Now, without further ado, lets get cracking on our in depth review of the Dell XPS 9360-1718SLV. When it comes down to the Dell XPS 9360-1718SLV, it's all in the display. Sure enough the laptop packs heat but it's most astounding feature is definitely its 13.3 inch infinity edge display. Why is it called infinity edge you ask? Well that's because its bezel is just 5.2 mm thick on the top as well as on its sides, that's the equivalent of 0.2 inches. However, not having a notorious bezel isn't all the screen delivers. No, you've also got a QHD display which means the resolution stands at 3200 by 1800 pixels. That's way above your standard Full HD laptop. Also, we're talking about an IGZO 2 IPS panel which means you get a wide 170º viewing angle. As if that wasn't enough reason to flip out over the display, it's actually tactile therefore you can interact with your laptop however you want, be it through the keyboard or through your "god-given keyboard". Also, if you where thinking about using this laptop outdoors then you should know that it delivers a cool 400 nits of brightness, just so you know the standard brightness setting is 200 nits on most laptops. Finally, you've also got a 72% color gamut as well as a pretty high contrast ratio of 1000:1. Moving away from the display (which isn't as easy as it sounds), the latest XPS to hit the market also delivers a sturdy aluminium unibody build which means the laptop chassis was manufactured out of a single piece of aluminium. All off this comes together to deliver a very lightweight laptop that weighs just shy of 2.7 pounds. 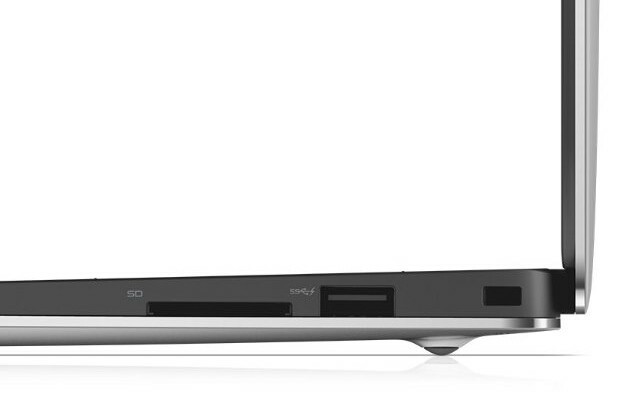 What's more, thanks to its minimalistic design Dell prides itself on it being a 13 inch laptop with an 11 inch form factor so commuting with this ultrabook isn't gonna be an issue. And yeah, the keyboard is backlit....obviously. What's under the hood? How's performance? While the display on the Dell XPS 9360-1718SLV is certainly top notch and that of an ultra high end laptop, the internals are a tad less impressive. Don't get us wrong, it's still an awesome laptop that delivers a killer performance but at its price range forgive us if we expected a bigger SSD drive or a higher end processor, especially when you can buy a Full HD Acer laptop with a 256GB SSD, 8GB of RAM and a 6th generation i5 for a fraction of the price. That said, we're still pretty happy with its internals. First off we've got a 7th generation Kaby Lake Intel Core i5-7200U dual core processor. This is a pretty good processor, launched in the second half of 2016, it packs a base frequency of 2.5GHz with a turboboost speed of 3.1GHz and 3MB of intel's smart cache. When looking at buying a new laptop I always opt for laptops that pack an i5 processor. Why is that? Well because the difference between an i5 and an i7 isn't as significant to merit the price difference and honestly I don't believe I'll actually notice it all that much. Also, the i5 has a very good price/specs balance as well as a solid performance and low energy consumption. All in all, I consider the i5 to be the best processor for a prosumer grade laptop. Onto RAM, we've got 8GB of LPDDR3 RAM. We should point out that it's maxed out at 8GB so there's no option to upgrade the RAM here. That said, if you're gonna be "stuck" with an amount of RAM then 8GB is the way to go. Sure, 12GB might be better on paper but you're unlikely to ever use the additional 4gigs unless you're pretty much a robot using seriously heavy apps all at a time. Don't get me wrong, I'm sure some people actually do need more than 8GB but for me, as a programer and video editor, 8GB has always been enough to meet all my demands and then some without having the system crash or lag because of lack of RAM. The last killer feature on the Dell 9360-1718SLV in review is the storage. Not because there's a lot of it but because it's of the SSD variety. On this regard we've got 128GB of SSD ultrafast storage. That means that booting the system will take just a few seconds and launching heavy apps will only take a fraction of the time they used to take on your old hard drive operated laptop. That said, we do have to say that 128GB seems rather low considering the price of this laptop. Especially when it's so easy to buy laptops with double the amount of SSD storage at a much more competitive price point. Sure enough they don't come with such an impressive display but you get to both spend less and get much more storage capacity. Can this be a gaming laptop? What about battery life? The Dell XPS 9360-1718SLV isn't by any accounts a gaming laptop. To be such you'd need a dedicated graphics which it lacks. That said, it does boast an Intel HD 620 Graphics controller which provides a steady frame rate at low settings on recent blockbusters such as TitanFall 2, Overwatch or Battlefield 1, to name a few. Again, this is not a gaming machine but at low settings it can be used for some casual gaming. Stuff like rendering 4K video and editing images on photoshop shouldn't be an issue either though for a professional editor we'd recommend getting a dedicated graphics chip. To be perfectly honest, there's not much info available when it comes to the Dell XPS 9360-1718SLV's battery life. That said, similar models within the XPS lineup that offer similar specs have been said to boast well above 10 hours of battery life. Personally, I'd assume in this case that this particular model would follow suit and deliver a similar battery life. Well, as you might've assumed there's no DVD drive on this one. There's also no ethernet port on the account of it being such a thin machine. As far as the rest of the connectivity is concerned we've got a couple of USB 3.0 ports, a standalone USB type C port, SD card reader and an audio jack. WiFi is pretty good considering it comes with the latest WiFi ac standard which delivers pretty good download speeds when using a compatible router and there's also your Bluetooth connectivity in case you wanted to use a bluetooth mouse or speaker. Speaking off sound, you've also got your MaxxAudio speakers which are pretty good. What's the verdict on this laptop? First things first: we love this laptop. The display is absolutely amazing with its QHD resolution and basically no bezel on the top and on the sides. That said, after our review of the Dell XPS 9360-1718SLV and considering the price tag on this laptop it doesn't really seem like we're getting that much bang for our buck. Especially when you consider the fact that Acer sells a Full HD laptop with double the storage, a fingerprint sensor and 8GB of DDR4 RAM for a fraction of the price. Now that that's out of the way, this is an amazing laptop by any standards. If you want a professional laptop that can handle just about anything you throw at it then this is a perfect fit. Also, if the screen is a big factor in your decision making process then I'd definitely go for this model. It's an amazing laptop, the only thing missing for it to be absolutely perfect is a tighter price tag, that's all we ask.